* Mission Eye and Ear — The latest in Lisa Mezzacappa‘s ongoing series of film/music collaborations, featuring short films with live-performed soundtracks. Tonight’s installment includes music by Darren Johnston, Aaron Novik, and Matt Ingalls. There’s a little more information in this article about Mezzacappa’s own band. 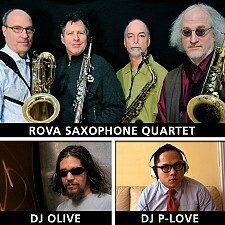 At Artists Television Access (992 Valencia Street @21st, San Francisco), Friday June 3, 8:00 p.m.
* ROVA + DJ Olive + DJ P-Love — As mentioned here, it’s the 33-1/3rd anniversary of ROVA’s first concert, and they’re celebrating with an SFJazz-sponsored, one-time concert. At Swedish American Hall (2174 Market St., San Francisco; same place as Cafe Du Nord), Saturday June 4, 8:00 p.m.
* sfSound — The modern-classical troupe performs a daytime set inspired by the Legion of Honor’s exhibit, “Pulp Fashion: The Art of Isabelle de Bochgrave.” Compositions will be interspersed with group improvisations. The program mentions some early-music influence, but don’t count on hearing harpsichords and recorders. Concert is free with museum admission. At the Legion of Honor Museum (100 34th St., San Francisco), Sunday June 5, 12:00 noon. * ROOM: Longer Burning — Pamela Z‘s ROOM series of shows has spotlighted individual instruments from time to time. Now it’s the violas’ turn. Hank Dutt (Kronos Quartet), Charlton Lee (Del Sol String Quartet), and Jhno (better known to me for electronics work) will perform solo and together and with Pamela Z. The program’s title comes from the classic portfolio of viola jokes that classical players know. At Royce Gallery (2901 Mariposa St., San Francisco), Sunday June 5, 8:00 p.m.
* Michael Formanek Quartet — Part of a West-coast tour with the band from The Rub and Spare Change: Formanek (bass), Tim Berne (sax), Craig Taborn (keys), and Gerald Cleaver (drums). Previously noted here. A rare chance to see these guys in California. At Yoshi’s Oakland (501 Embarcadero West, Jack London Square, Oakland), Monday June 6, 8:00 p.m.
UPDATE: The L.A. Times has a review of Formanek’s June 1 performance at the Blue Whale. * Jazz at the Make-Out Room — First-Monday jazz returns to this friendly Mission District bar. I think they’d had to move elsewhere for a month or two, so hopefully, the bar has welcomed them back. (This is another series that was being organized by Lisa Mezzacappa.) This installment includes the Steve Adams Trio (Adams being from ROVA), Doug Stuart’s Catfish, and the latest edition of Jim Ryan’s Forward Energy. Adams did a Trio album a while back, eventually released on Clean Feed; Forward Energy is an improv-jazz group that’s been Ryan’s vehicle for a couple of decades at least. Because it’s at a bar, there’s a good chance they’ll start late — meaning it might be possible to catch both Formanek and this show. BART could do the Bay-crossing for you. At the Make-Out Room (3225 22nd St., San Francisco), Monday June 6, 8:00 p.m.